Got a mildly disturbing email from the NLC - regarding parking lots - So I called the NLC - no information - so I called the ticket office and they said that they're trying to crack down on excessive drinking - but tailgating is fine - but canopies, not so much. But, that's the rule anyway - no canopies in the parking lots (general and preferred) - I guess we'll just have to see how it pans out. This is the part that I hate - just let me tailgate people - just let me tailgate. I wonder if Reese Davis is sleepy yet? So, I come home from work yesterday, and I settle in to watch the DVRed "College Football Live" episode from that afternoon - I notice that the little "record" light is on the machine - I curse a but because I have it programed to record only "new" episodes, and I assume that the machine is recording a re-run of the afternoon show. So I let the machine continue recording - they'd have to say something about PSU during 25 hours of coverage, right? So Kirk Herbstreit continued his touting of the PSU squad - he said that the other teams are good, but that PSU is the team to beat. While this makes me incredibly nervous, it also causes me to say things like "I love you" out loud, to the tv. And, I really think that any jinxlike karma that might be floating around in the atmosphere, is seriously negated when Reese "yes I frost my hair" Davis closes the segment by saying "...as michigan, ohio state, wisconsin, and (chuckle), maybe, Penn State, battle for the Big Ten title." Jacknut. 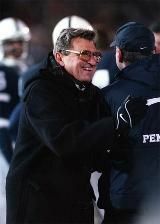 Of course my cynical side suggests that Herbie's comments are only a means to "remind" teams to be ready to play PSU. Oh well. And, the little "intro" that they showed every hour or so featured a lot PSU footage - so I spend about 10 minutes doing the "is that Penn State?" Stop. Rewind. (another one of the indispensable things about the DVR) - Yea! it is! They showed the outside of the stadium (and a rather tame version of Paternoville), the players going through the tunnel, the kickoff, and they ended with a shot of the East stands. I'll get my PSU fix any way I can. So I can't wait until lunch time so I can dash home and watch some more PSU snubbing. It's football time. Q: Are you planning on running out of the tunnel with the team? Combine vodka, blue curacao and sours mix in a cocktail shaker with ice. Check out the game notes on GoPSUsports.com. Do you remember your first Penn State football game? I actually do not remember my first Penn State game(s) - I have vague memories of being at the stadium - and I definitely remember listening to games on the radio, waiting for my dad to come home - hopefully in a good mood. The first game of which I have a vivid memory is PSU v Stanford. The game was at Beaver Stadium and it was a pretty huge deal for me to be going to the game with my dad. While I don't remember the game so much, I do remember that the Nittany Lion put the Cardinal in a cage. This upset me very much because I couldn't understand why the mascot would allow such humiliation - Dad eventually just told me that it wasn't the real mascot - probably so I'd be quiet. The first "big" game I remember going to was against Alabama. It was a TV game (big big night) - and the TV people brought in lights - I remember asking Dad if PSU would ever get permanent lights - and he said - no way - it's tradition. It was easily one of the most intense sports experiences of my life - it was a great day. So, we need a theme for the the ohio state university tailgate. So far we're planning: Mediterranean (fiu); English (nd); Pro Lions (ie, culinary classics hailing from the different towns in which PSUers play pro ball- buffalo); Oktoberfest (iowa); Fiesta (wisky); French (purdon't); and Italian (Temple in Philly). It's a late game - for which we, generally, try to pick a theme that lends itself to all day fare - breakfast, lunch, dinner and lots of snacks - also, the game is in late October - it could be very cold - or not - and the tailgate crowd will be quite large (50-100+) - so we need a subject that is versatile. Penn State opens the 2007 College Football season on September 1st, by hosting the golden panthers of florida international. The former Sunblazers (changed to golden panthers in 1987) don uniforms of blue and old gold - I'll tell you now, you just need to retire all of your clothing, jewelry and accessories (check the hinges of your sunglasses please) that feature any gold, tan, or yellowish hue this season - we're playing a lot of _____ and yellow teams this season. There isn't much to report on the football front regarding the panthers. Sadly, their most notorious moment as a team has nothing to do with football. However, fiu, will enter Happy Valley with some experience at running back and a few returning seniors on defense. Mediterranean Sea Food, of course! We'll have some grilled shrimp and complimentary sides (you look really tall today) including (but, certainly not limited to) white bean and rosemary dip, homemade hummus, tapenade, fresh fruit and cake! Gametime is 12pm - and parking lots open at 7am - we'll be there when they open the gates and, as usual, we're planning on parking in Lot 13 - the parking maps have changed again this year - we expect to park in the section of the lot closer to the stadium - look for the PSU flag (ha ha ha ha)- for more detailed directions, email us for cell phone numbers. oh my goodness - I can't believe that in one week we'll be all excited and trying to concentrate at work until it's time to hop in the car and drive up to State College! Yea! Football. It's almost Penn State Football Time! The off-season seemed so long this year - but August has flown (whoosh!) by. We've been busy planning tailgates and preparing yummy yummy food! 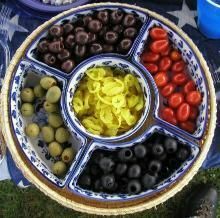 One new recipe that was developed this summer will be featured a the first tailgate - homemade guacamole. I know that there seems to be a glaring omission of onion - but I really don't care for raw onions - although I have made the above recipe and added some minced shallot or green onion. 1. Halve the avocados and. using that often demonstrated method, remove the pit and scoop the flesh into a medium sized bowl; using a fork, cut up the pieces (ie, pre-mash). 2. Add the garlic, lime juice and pepper. 3. Mash all of the ingredients together until you get a chunky paste. 4. Fold in the tomatoes. I got the questions from RUTS - JB over at There Is No Name on My Jersey wrote the questions this week. I'm gonna be a rebel like Bryan K and post my responses here! 1. We’ll start with the bad news, what is your take on PSU’s off-season? The team has stated they are focusing on winning a National Title, will these off-field shenanigans get in the way of that lofty goal? I think that off season tomfoolery (if you will) always affects the team - hopefully the coaches and the players can refocus - of course, we as fans have to remember that these are young adults that really do have lives to live off of the field (NO WAY - not until they’ve used up those years of eligibility!). 2. Competition abounds! Give you take on the battle to start in the secondary. Do you prefer to have a rowdy competition or know who your guys will be? Competition is good - indecision and uncertainty are bad. It’s time to start the season - let the kids know where they’re going to be so they can be ready. 3. Describe your behavior as a PSU fan. I know some who are hand wringing nervous pacers and others who are drunken revelers before the football gods — where do you fit? I’d say I’m a nervous reveler. I get really caught up in the game and the excitement of it all. In the stadium, I’m one of those fans who yells on every defensive down - and on every offensive down I yell “throw the ball to Butler - yes, I realize he’s on the sideline - I don’t care!” I can usually be caught doing the same when watching the game on TV - although I am aware that "they can't hear you PSUgirl" (shut up and go home) the football gods can. I like to watch games with PSU fan friends, as long as they understand that I'm not going to be very social or "a good sport" during the game. I do pace, but I have a friend (with whom I regularly watch games) who is a runner - it's awesome. Well, the players are rarely in the seats, so I don’t really see it as a problem - white background makes it easier to see the blue unis anyway. On a personal level, white is not the most flattering hue for my complexion - I much prefer a rich navy - but a little lip rouge and mascara will generally do the trick. 5. Who would you rather punch in the face: Lee Corso, Mark May, Lou Holtz, or Charlie Weiss? I’ve only ever punched one person in my life, and that was only after he dared me to do it. And I doubt that it would do any good to hit any of those guys anyway: Lee would take it as a compliment; May would just keep talking; it would probably cause Lou to sthpit even more when he sthpeaks; and, Charlie would probably have you killed, bled out and then roasted on a rotisserie for lunch. So RUTS authored a post highlighting some of the more odious displays of PSU textiles available. It led me to ponder those items that I have in my PSU wardrobe. Every year when we went back to school clothes shopping I would get a new Penn State sweatshirt - it was just part of your wardrobe. I have an exceptionally good friend who has worked in and around PSU merchandizing since we were in high school - she has been the source of many a "unique" PSU item. Both my mother and I are addicted to Moyer's Jeweler's PSU jewelry. "I want my 2 seconds"
"throw the ball to butler"
So, it's not a ton of stuff - I've, historically, attempted to fashion my gameday gear from blue and white non-logo items - but lately I've found more and more PSU t-shirts in my wardrobe. My favorite item is, probably... my Nittany Lion cameo necklace from Moyer's Jewelers - I've had it for a long time and I love it - the only problem is that it's set in yellow gold - so it can't be worn for many games. Actually, they'll be here before we know it - it's that time of the off season when the palpitations kick in when you think about traveling up to State College, tailgating and hearing the Blue Band marching into the stadium for the first time (since blue white) this season. You find yourself clicking on the "driving to Penn State" and/or "PSU game day" playlists on your iPod and getting a little giddy about the opening bars of "Hail to the Lion" and jumping around the house to "Song 2". And then there's the football. It's like there's an ache in your heart that can only be subsided by the sight and sounds of the game. I was panicking Sunday night because I couldn't find the Hall of Fame game (yes, I realize that it's pre-season NFL - but it's football!) - darn NFL network - I got to see the last quarter anyway. All the anticipation and hope for the season has been bottling up since the win in the Outback Bowl. The Lions have a lot of talent returning to the team this season - and much of that talent has experience. But I have no idea what to expect from this team - the defense should be solid - but the secondary has had to (still has to) endure a lot of "off the field" distractions this off season and with the shifting of positions and some new men up front - it's going to take some time for the team to get in sync. On offense it's the same questions we seem to have every year - will the qb be able to throw the ball; if he is, will the receivers be able to catch it; will the o-line protect the qb and create lanes for the running game; and, will Austin Scott show up for team meetings? Bit it's getting close. Soon we will be walking around the State College Wegmans chanting (roughly to the tune of Howdy Doody) "It's Penn State Football time!" (and yes, there is a dance). Unfortunately, last season there, again, seemed to be a sluggishness on the team - a sort of going through the motions - there were some great moments (like Deon breaking the receiving record and the defensive effort against tenn) but I just didn't see the sustained intensity that was so apparent with the '05 team. There have been many distractions this year - most of them having nothing to do with athletics - and the consequences are yet to be fully realized. We know that the team can rally to the aid of one - here's hoping that they can show as much solidarity and commitment at game time. PSU is searching for leaders on their team - players who love the game and motivate their teammates off and on the field. These kids know "it" can happen (most were around in '05) but they have to figure out how to make it happen. Football practice begins today. Less than one month before the season opener - the Nittany Lions are sitting in the national polls in the high teens. 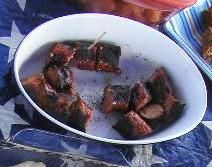 And, for my part, tonight we'll be "test driving" a few grilled fish recipes (in prepartation for the FI game tailgate) - should be fun! The recipe is simple but the actual charring of the links is critical to achieving the true experience. Grill the Kielbasa (on charcoal or propane) until charred on all sides. Remove from grill. If grilling at the game, transfer to dish. If not grilling at the game, wrap in aluminum foil and leave in warming oven until leaving for game. Cut into pieces approximately 1 – 1-½ inches & stick with toothpicks. Serve alongside dipping mustard. The PSU game is really temple's marquee home game - and the owls are doing what they can to capitalize on the Nov 10th event. This week there has been a "pre-sale" for single tickets - $40 - $70 a piece. The pre-sale is, technically, for temple people - but hey! I graduated from temple! While in grad school, I went to an "away" PSU Temple game - i got my tickets through temple - the stadium was packed with Penn Staters - but we were sitting with temple fans - they were very nice - and we weren't jerks - so it all worked out fine.